The gardener who desires geraniums grown from seeds must plan ahead to have blossoming seedlings ready to transplant outside in the spring. Because geraniums germinate and grow slowly, the seed-starting process will take many weeks before the plants are large enough to transplant. 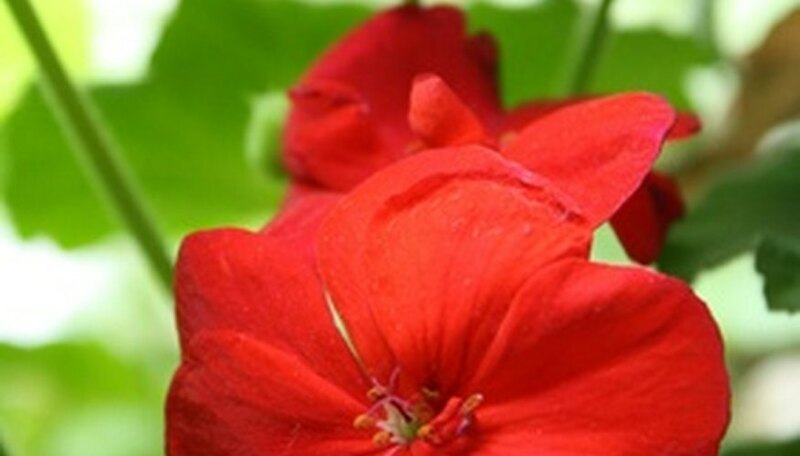 According to Iowa State University Horticulture & Home Pest News, geraniums grown from seeds often grow more energetically and vibrantly than geraniums grown from stem cuttings. Start geranium seeds in preparation for late spring planting to enjoy a colorful geranium display. Fill the individual compartments in the seed-starting tray to the top with potting soil approximately four months prior to spring planting. Spray the surface of the potting soil evenly with the spray bottle to moisten the soil. Place one geranium seed in each compartment of the seed-starting tray and cover each seed with 1/8-inch of potting soil. Mist the soil lightly with water again. Stretch a piece of plastic wrap over the top of the seed-starting tray to keep the potting soil moist. Set the seed-starting tray in an indoor location with indirect light and temperatures around 75 F. Mist the soil surface every day with water to keep it moist. Remove the plastic wrap from the seed-starting tray after the seeds germinate. Germination time ranges from one to four weeks. Move the seed-starting tray beneath the grow light after the seeds germinate. Position the grow light approximately 6 inches above the seedlings and keep the grow light on between 12 and 16 hours out of every 24-hour-period. Keep the potting soil evenly moist by spraying the soil with the spray bottle whenever it begins to dry out. Pinch off the top growth of the geranium seedlings when the seedlings reach 4 to 6 inches in height to encourage the seedlings to grow laterally instead of taller. Mix the fertilizer with water at one-quarter of the recommended strength and carefully pour fertilizer around the potting soil once per week to fertilize the seedlings. Harden-off the geranium seedlings approximately one week prior to transplanting them outdoors. Move the seedlings outdoors during the middle of the afternoon to a sheltered location out of direct sunlight. Keep the seedlings outdoors for two hours and then move them back indoors. Gradually increase the time outside each day and move them to a less sheltered location so that by the end of the week, the seedlings are ready to grow outdoors. Transplant the geranium seedlings outdoors after all threat of spring frost passes. Dig holes in well-draining soil and move the seedlings from their temporary containers to the prepared outdoor growing area. Place the seedlings into the holes so they are at the same depth as they were previously growing.